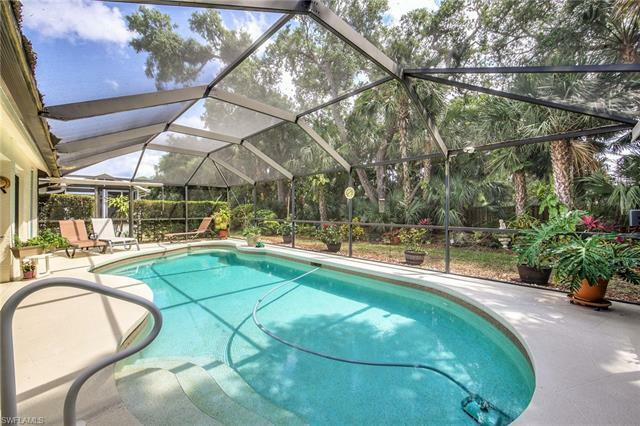 This light and bright 2 bedroom plus a den, single family pool home has been immaculately maintained. A few of the many upgrades include: a solar heater for the pool, upgraded kitchen and wood flooring in bedrooms, with tile flooring throughout the remainder of the home. New pavers have been sealed on the driveway and walkway. All doors and windows have High Impact Glass. No need for shutters! Appliances include a side by side refrigerator/freezer, glass top stove, and newer washer/dryer. Enjoy the state-of-the-art clubhouse, where you can enjoy dining at the Creek Side restaurant after a round of golf on the communities 18 hole executive (Par 61) golf course. The home is conveniently located close to Coconut Point shopping center, Gulf Coast Town Center, Miromar Outlets, I-75, and the Florida International Airport.